New World Snooker is situated in the center of Ilford, located adjacent to The Ilford Shopping Mall multi- storey car par, it a short two minute walk from Ilford Railway Station (Main line). It can be found just of Ley Street at the junction with Myrtle Road. You can access the club via walking through The Shopping Mall at the High Road and Station entrances and exit via the car park near the 99p store. 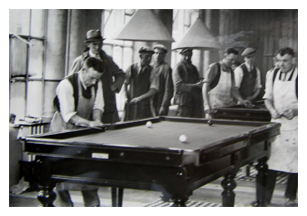 Billiards was first played in the 16th century. It was known as a "gentleman's game" because of its popularity among royalty. The tables had no side rails, pockets, or cushions, but only contained holes for the balls to be potted.